Included are recordings of my yukky voice. If I remember correctly, Nigel Michi was the poem that started it all -- the Nigel craziness, that is. Michi has poems here, too -- the one entitled Angie Nigel is, erm, particularly interesting. Since it seemed churlish not to answer Michi's tag and being in a playful mood ever since resigning my editorial post, here are my answers. Whoever reads this must consider him-/herself *tagged*. Hee. Wheeee!! I'm in the current issues of Tryst (The Undoing of Lace) and Wicked Alice (The Fictionalization of Nigel). Well, I've sat on it for months. And have finally decided to resign as editor. Sigh... and yay! I'm all bunny-ears happy with this decision. Have volunteered to help with Steve Schroeder's project to build a searchable, sortable Publication Database. More info can be found at his blog. Thanks to Nathan for spreading the word! Hope others jump in... it's fun or pleasantly masochistic (depending on how your analyst looks at it). Hee. Thoughts: Eeek. I suggested this site to tons of people as a beginner's market... hopefully, they've had more luck. Actually what I mean is -- hopefully no one will want my neck in case of rejection. Hope everyone had a nice Easter. We just went to the in-law's house for a light supper... as in beef lasagne, white asparagus with hard-boiled eggs, various veggy side-dishes, strawberries in lemon juice, the traditional colomba and one (1) bottle of prosecco. All very light and healthy. I slept until noon for reasons of digestion. Naturally. And, just noticed that the March issue of Fireweed has included my second-ever graphic poem, Like Turned Tables (or, An Astrological Chart Based on the Common Ashtray as It Appears in Dreams). Gary, the editor, commented that he liked the fact that the ashtray is dirty. Even though I worked one whole day to get the photoem done, I had to look at it again to notice that... which sort of sums up my housekeeping skills. Hee. Very quick response times, considering this is a print magazine. Very professional manners, too. Payment is one complimentary copy -- though they don't state this anywhere. I hear that they're quite severe with guidelines... so take extra care and follow them to the letter. Otherwise, . Hah! Thoughts: Hmmmm. I like editors who put up a fight. by Nathan into revealing 7 things about me. Anyone reading this... please consider yourself tagged as well. Hee. It's a trap. 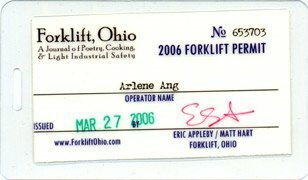 I've become a Forklift, Ohio operator. They sent this ultra-kewl ID along with the funniest publication contract I've ever signed. They mentioned possibly offering lodgings to their operators. Yay! I'm calling Mum... and the rest of the family and my husband's family. Anyone else wants to transfer to Cincinnati? Hubby still doing poorly. No cure for orchitis apart from bed rest, I'm afraid. Am mostly puttering around in the kitchen or doing the grocery. Twice or thrice I bit my nails in the GP's waiting room. Have -- wheeeeee!! -- finished revising 28 poems for the Bundles of Letters including A, V and Epsilon manuscript which I'm doing with Valerie Fox. She presently has three quirky poems from the book at sonaweb. Deadline is coming up fast and I'm fairly in a panic. Have also *learnt* how to do a PDF file. I'm quite thrilled about this. With Valerie living in the US and me here -- it seemed the best way to set the book layout and fonts from my computer to hers... MS Word files create havoc with the pages especially from Mac to PC. What else? There are tons of unanswered e-mails in my Inbox: more than half of these think I need Cialis or Viagra. Someone shot my muse in the hiney. She's gone, leaving a bloody hiney print on the scanner glass. No other sign of the hair brush. For two days, my door keys disappeared. The garbage in the kitchen gets more rowdy by the day. I'm learning a lot about painkillers. A new revision of an old, endlessly rejected poem, Weather-wise is up in the current issue of Eclectica. Teehee. If you scroll down, you'll see Michi doing funny things with Nigel. The last one is about my much-advertised relationship with the plantarium, of course.